Wrapped in the protection of 2.5-layer Artex™ Hardshell fabric, taped seams, and water-resistant zippers, the Men’s Syncline Jacket from Showers Pass transforms you into a Master of Attunement, adaptable to the wettest and dimmest of conditions. In addition to reliable waterproofness, this jacket is lightweight with a semi-relaxed fit that moves in harmony with the body. These powerful fortifications are balanced out by zippered underarm and cross-core vents, regulating interior temperature and moisture so you stay dry and comfortably cool as you shred to your heart’s content. The hem can be adjusted via double toggle cinchers for a custom fit. The hood is adjustable as well and designed to fit beneath your helmet so your head is equally protected from the elements. For low light and nighttime visibility, the front, back, and sleeves feature 3M™ Scotchlite™ reflective accents. Breathable: cross-core vents & underarm zips (Breathability rating: 10,000 g/m²). Waterproof: Artex™ (2.5-layer) & taped seams (Waterproof rating: 15,000mm). Semi-relaxed fit optimized for MTB ride position. Adjustable hood that fits under helmet. Double toggle hem cinch for close fit. 3M™ Scotchlite™ reflective accents on back, sleeves, and front. Very functional rain jacket. Never had a hooded cycling jacket before but this one has actually come in quite handy on cold rainy days. Most trips have been relatively short commutes (under 10 miles) so moisture build up inside the jacket hasn't been a big problem so far. Fits well, breathes well. Have been wearing it skate skiing, so high aerobic to anaerobic and just a small amount of moisture on the inside after 90 minutes. Havent really needed to open the vents. The angled pockets can be tricky to zipunzip with one hand, but not used to the angle so Im pulling at the less-than-perfect angle. The hood is extraneous, but not in the way so far. Waterproofing seems great so far. Great all purpose , hi visibility rain jacket. This is a great jacket from Showers Pass. I use it for riding around town as well as in casual circumstances. Only needs to zip up in it's own pocket, then it would get 5 stars. Waterproof in heavy rain, durable zippers, great seams. Light weight - perfect for commuting in the PortlandVancouver area. Keeps me dry but not over heat on my rides. Great visibility with the bright color. Must have for changing weather! I bought this jacket for my long SE Asia ride where weather could change seemingly on a dime. I worn this through early morning fog, bright sunshine and 5-minute each monsoon. It carried me through all of these, except when the sun was up, I can feel sweat collecting around my elbows. You need to have some kind of base layers to ride in cool weather, as there is no insulate capability. But is light weight, looks good, gets you notice on the road and repels water except for real heavy down pour. I can take it off and roll it tight to stuff into my back pocket. The best feature is the hood, it won't cover your helmet but does a good job keep your head warm tucking underneath the helmet. Glad I got it. You would too. Like the jacket. Looks good. My only real concern is it really doesn't breath well. Even with vents open it just seems to condense on the inside. I sweat a lot and when I get to work even in a colder downpour the inside is always wet (not from the rain though). NIce light weight rain jacket. I like it on and off the bike, very light and well made. I remain completely dry under all conditions. I can PLAN to ride in rain!! Green color with reflective accents - I am always visible. Keep totally dry - the hood is snug, fits under helmet easily and adjusts easily. Velcro sleeves seal out rain when tightened over gloves. Waterproof from outside in and breathable from inside out. I have used this jacket many time and I love it. It works great on the bike when it it really wet but also great for hiking, running or just to the store. It keep me dry. Does it breath like a 400 dollar Gore jacket ..... no but for the price this is a fantastic jacket. Plus you can use it for other activities . I like the hood, I don't have a problem with it when riding and it's great to have when doing other things. Runs true to size. Not a jacket for race day but for training can't beat it. This is a nice jacket for light rain. It's full cut makes layering possible in cooler weather. It's light and packable too. If you need a jacket for a deluge go with GoreTex. Have not used yet. Fits little large. feels like good heavy-duty material. 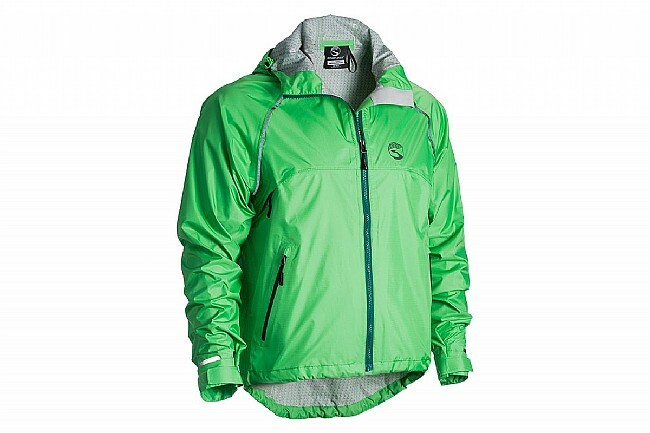 I love this jacket, it is bright and has a hood, which a lot of the shower pass jackets do not have. I wore this jacket in a kayak race in the rain, and stayed dry! Would definitely buy this coat again. Does a good job of keeping off the rain, so customers complained of hood, but I found it to be quite useful in heavy rains, I put the hood on and my helmet over the hood. by Cycler, jogger, dog walker. Cycling, jogging, walking the dog. Works for me. It's much lighter than my old jacket without any real negatives. I like having a hood and the price was a major plus. I appreciate the inner and outer pockets. My first reaction to this jacket is that it doesn't add a lot of warmth. That's not a problem because I can simply add more layers in cold weather. I'm suspecting that it's because of its breathability. I think it will become a big advantage when things warm up later in the year. I tend to sweat a lot when I ride, so I have low expectations for staying dry with any jacket, but so far this jacket has done pretty well on rides. The hood is thin and works pretty well under the helmet. I've found this jacket works well for just walking around too. We got this jacket on sale to use not on the bike but for morning walks. It's a lightweight rain shell that can layer up for any temperature. The fit is nice. It vents appropriately. It's not noisy like some rain jackets. The price made it a deal to not pass up, the quality makes it a deal at any price. I ride with a group on Tuesday's and Sunday's regardless of the weather. Living in Oregon it rains a lot so I wanted something to keep me dry. This jacket works better than I could imagine! I particularly liked the hood which fit nicely under the helmet. Quality seam work and zippers.